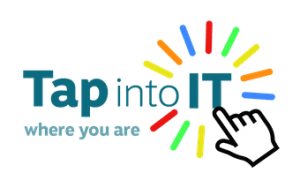 Tap into IT Where You Are run 5 computer clubs in Edinburgh. 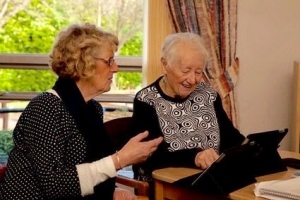 Three of the computer clubs are based at Viewpoint Sheltered Housing locations around Edinburgh. We have been working with Viewpoint for over 5 years. 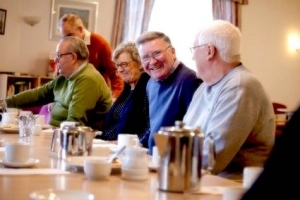 The pop-up club is based at Bield Sheltered Housing in Leith and opens to new recruits on 11 March 2019. Each club is run by a Facilitator with the help of PVG checked and trained Volunteers from the local community. 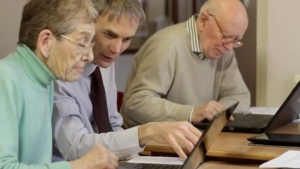 Our computer clubs are open to non-residents too, so if you are interested in joining a club, please get in touch. for Club Users who want to build their confidence in the ‘basics’ of using their device, web search and email. This is likely to include you if you’ve recently completed 1:1 ‘beginner’ sessions. We’ll encourage you to move on when you are ready to explore other things through the Taster and Project groups. one or two sessions to introduce you to a range of things that you can do online/with your device. these will give you a chance to work at something for a longer period, from 5-6 weeks, a whole term or perhaps even longer. The group leaders will work out a programme including what the group aims to achieve (modest goals) in each Club session. for those of you who want help with something specific or more pressing that isn’t catered for within any of the other groups at the time. Tap into It Where You Are aspire to be inclusive of everyone who can benefit from access to the internet and learning basic computer skills. a Protection of Vulnerable Groups (PVG) check rather than just a Standard Disclosure. 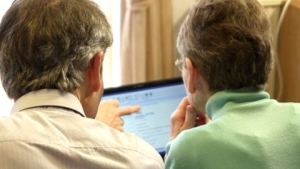 If, in your capacity as carer, you have someone in mind or have any questions about any aspects of the computer clubs, please do not hesitate to contact us for further information. 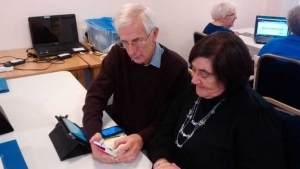 Our Computer Clubs generally run for 39 weeks of the year in 9 week blocks. The weekly session is 2 hours and finishes up with a tea/coffee and a chat. In our experience, people get to know each other and look forward as much to ‘social’ time as the informal ‘tech support’! We also offer additional one to one sessions (approx one per Club week) for those requiring help to get started. Learned a lot of different things – even made labels for my Christmas cards and I have organised my photos. I have also found out about the NHS. Thankfully, don’t need it yet! Social side very good. Great fun Christmas party. Very helpful and sociable tutors (especially Bob). I like the company. I use the iPad all the time at home.